Studying the Word of God is one of my favorite things to do! Reading it is like sitting down with the Lord Himself and asking Him to tell us the story of His creation from beginning up to now, and even some of what is to come, as well as learning what He wants for us as His children! The first step in getting to know the Word of God better is to read the Bible all the way through at least once. Personally, I like reading it a complete book at a time. The context of a story or teaching makes so much more sense to me when read in larger chunks. There are so many plans out there for getting through the Bible, whether you want to read it quickly or slowly. There are one-year, 9-month, 6-month, and 3-month Bible reading plans to choose from. You can read the Word chronologically, or you can read a tiny bit of Old Testament, New Testament, a Psalm, and a Proverb each day. No matter what plan you choose, it's just important that you do it. Once you've read through all of the Bible through once, now you are ready for more info. You've got the gist of the storyline fresh in mind. Now, you are ready to find out more about the context of the story. 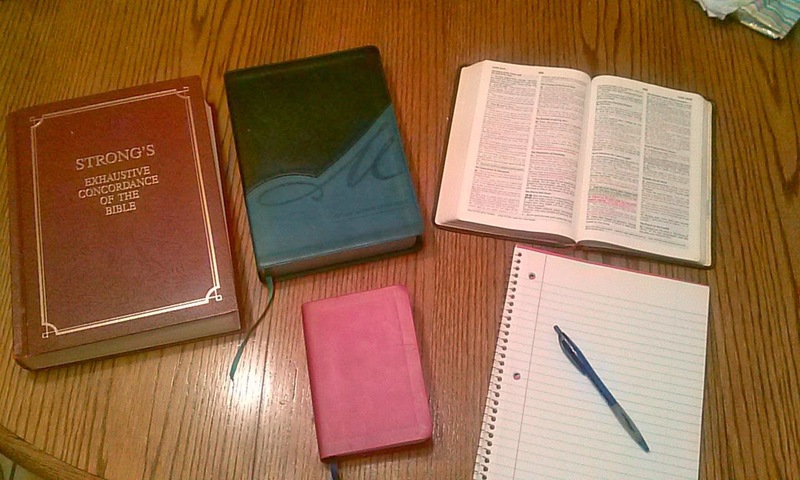 Here is where you want to choose the right Bible for your study time. 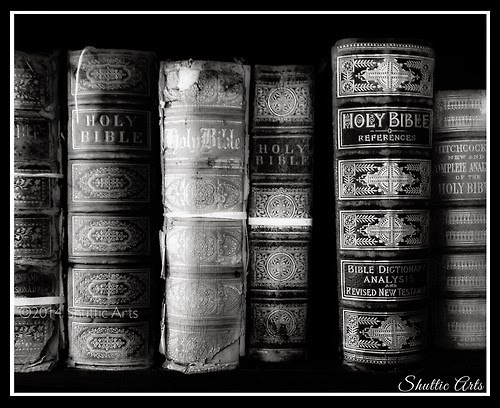 There are "regular ole Bibles", which are just the texts of Scripture, with no additional information. 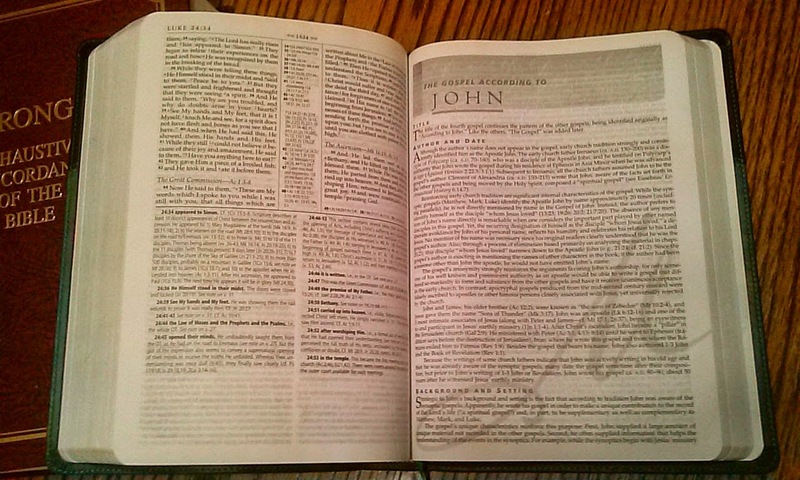 There are a few Bibles that give some extra info about each book or author or setting. And then there are Bibles that give you lots of extra info about the text, and even includes commentary, or explanation, for each portion of Scripture. When I sit down to study, I have a "regular ole" New King James Version Bible as well as my New American Standard Version study Bible (the Macarthur Study Bible). Since I do not yet have the Parallel Bible that I've been wanting, I also have a small King James Bible for referencing the text. In addition to those Bibles, I also keep my Strong's Exhaustive Concordance of the Bible nearby, along with some form of notebook or journal, and my favorite ball-point pens! This Macarthur Study Bible contains information about the title of the book, the author and date, background and setting, historical and theological themes, and interpretive challenges. That is a LOT of information to know before ever reading the first word of the Scriptures. It also provides an outline of what I'll be reading about. That is helpful when referencing back through the book later in my study time. Basically, when I'm reading to study, I make sure that I understand who wrote it, to whom it was written, and any other context that will be helpful. Then, as I read, I use the King James Bible to see what the original translation said (other than Thee, Thou, Thy), because my Concordance includes those English words. As I read, I am also praying and listening to God about what I'm reading. Sometimes He will reveal something to me from the text alone. Sometimes He leads me to the commentary in the study Bible for an explanation written by someone else. I underline in my Bibles (gasp! ), or even jot a short note beside a passage, and I take notes in a notebook. I write down words I want to look up, so that I do not forget to do that, and I write down questions that I have, so that I can either study it further or ask my husband later. The purpose of reading the Bible is NOT to know all there is to know about God. We can know about Him, and still never know Him personally. We read and study in order that we get to know who He was...because He still is....and we get to know His heart for His children and His grand plan to save us, as well as His best plans for us while here on this earth. Also...we are to learn His word so that we can teach it to others! We may be teaching it to our children at home or to younger women when we grow older. I'd love to hear how YOU study the Bible! Please share in the comments! You may inspire another reader in her study time! The king made a copy of the Word in order to know the Lord and the Word he wrote down stayed with Him throughout his life. It is easier to commit verse to heart and memory if we have taken the time to write it down ourselves. When I am getting stressed throughout the day it also helps me so much to get grounded when I write down a verse even if it is just one.